A handful of wardens and biologists undertook such a hazing operation Friday that sought to separate wildlife from domestic stock after a herd of 100 bison invaded Moose Head Ranch in Grand Teton National Park. They’d overwhelmed a livestock feed line and gored at least one horse. On snowmobiles, the Game and Fish crew gently pushed the approximately 50 wild bison they found into a pasture where the shaggy brigade stopped its journey and turned on their herders. The herd — it’s called “an obstinacy of buffalo” for good reason — wanted to go back north to the feed. So they took off at full speed — bison can run up to 35 mph — in that direction. The herding snowmobilers also zoomed back until their speeding snow sleds outflanked the galloping group. The sledders — Kyle Lash, Mike Boyce, Cody Schoonover and Clark Johnson — were experienced herders and observers of animal behavior, she said. They stalled the group’s feed-line foray and gradually got the animals moving toward U.S. 191 — a heavily traveled route that had been closed to traffic for the bison drive. 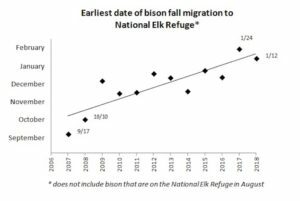 Hopes were that the heavy-hoofed herd might turn south toward its traditional wintering grounds on the National Elk Refuge about 10 miles away. The Moose Head Ranch operates in the National Park near Moran about 25 miles north Jackson. 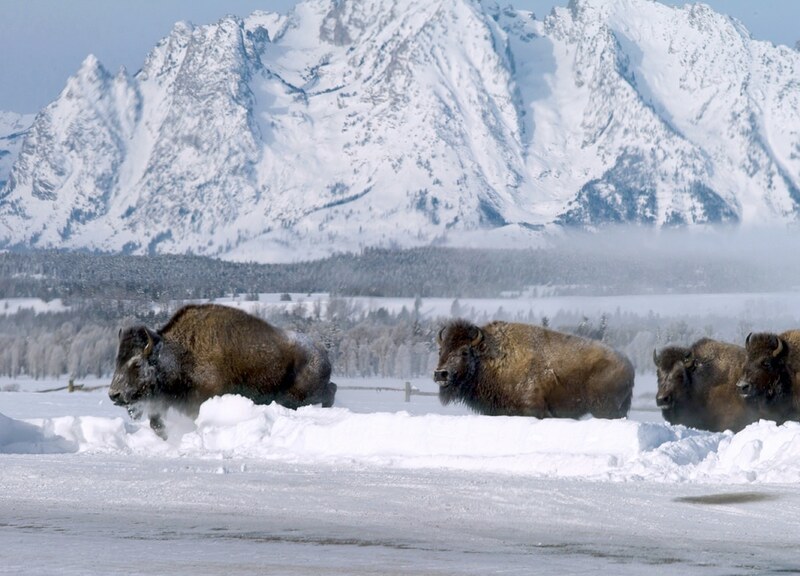 In the early 2000s, when the bison herd was as large as 1,200 animals, subsets would winter in the Moran area of northern Jackson Hole. More recently, with a population of perhaps 590, most of the herd clomps south to winter on the Elk Refuge where they receive supplemental rations of alfalfa pellets, usually in a feed line apart from the elk. The bison were minding their own business up north this winter until a big snowstorm hit. Snowfall Monday and Tuesday broke daily records for Feb. 4 and 5 in Jackson where 21 inches of snow accumulated in 48 hours. The horse feed line at the Moose Head was “the only place that wasn’t five feet deep with snow,” said Chris Davenport, owner-operator of the ranch. “They’ve been there on and off for a while,” he said of the bison, but not in numbers. After learning of the conflict and Davenport’s call for help, Game and Fish Department and Grand Teton National Park managers hatched the induced-migration plan. 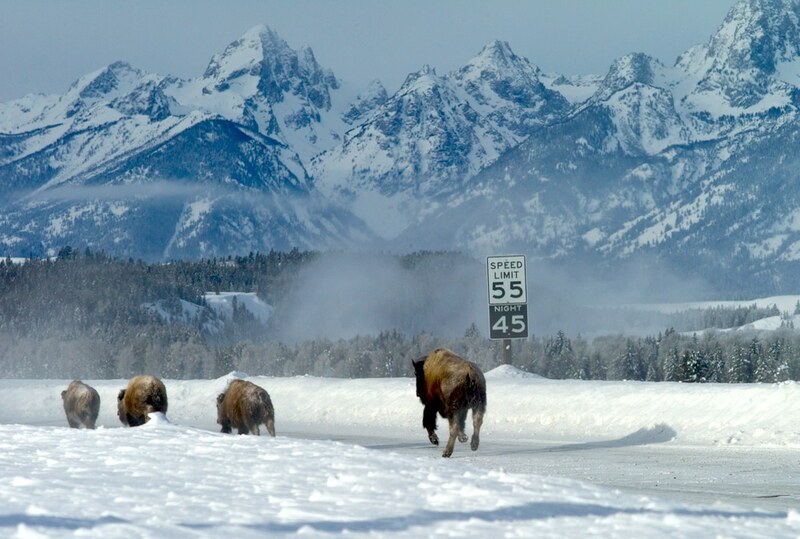 Grand Teton would close U.S. Highway 191 and Game and Fish Department bison wranglers would herd the group onto the plowed roadway. On the plowed, paved road “they can easily walk several miles away from the private land to an area where the animals can find natural forage away from livestock,” officials said in announcing the highway closure. Park and Game and Fish vehicles would encourage the beasts south for several miles between chest-high snowbanks. About a mile and a half down the highway “some folks from park found an existing trail — some bison had punched in a trail,” Courtemanch said. The deep and narrow path trammeled down earlier by an unknown group of bison led south off the highway and toward the National Elk Refuge. When the savvy old females hit the highway Friday, they saw a three-vehicle roadblock to the north and the driveway to Triangle X Ranch also blocked. They quickly turned south with their cohorts behind them and thundered down the highway, later slowing to an amble. Managers had to be flexible in planning the operation, Grand Teton spokeswoman Denise Germann said. “It moved rather quickly,” she said of the roundup plan. Two years ago, the park helped with a similar drive, but with only a handful of bison, she said. Friday’s operation was much larger and unprecedented. “This was a first for us,” she said. Grand Teton officials gave Game and Fish permission to operate snowmobiles across park meadows. They and Game and Fish announced Wednesday that the highway would be closed from 9 a.m. to 4 p.m. Friday — perhaps for less time if the bison moved expeditiously. That caused a flurry of worries, Germann said. Once on the plowed road, the bison made steady progress south to their compatriots’ recently broken trail near Hedrick Pond where they took a break. After resting for perhaps 15 minutes, some started picking their way off the highway and onto the newly beaten path toward open country and the Elk Refuge. Wildlife managers packed a trail across that plain to encourage the herd to move south. They reopened the highway at 11:35 a.m. Biologists and wardens sought to keep tabs on the herd and didn’t see any move back to the highway or ranch over the weekend, Game and Fish spokesman Mark Gocke said. They also resolved a minor mystery about what happened to the rest of the herd. They found and drove about 50 south but the other half of the group remained elusive. Wildlife managers finally spotted the missing 50 Friday afternoon above the Moose Head Ranch on Wolf Ridge. 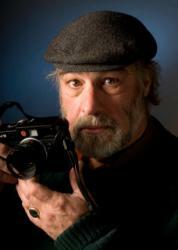 Moose Head Ranch owner Davenport thanked the Park Service and Game and Fish Department. “I’m extremely happy,” he said. The Jackson Bison Herd grew from a group of 20 bison brought in 1948 from Yellowstone National Park to the 1,500 acre Jackson Hole Wildlife Park near Moran. The area at that time was part of the Jackson Hole National Monument, including 35,000 acres owned by John D. Rockefeller Jr.
A large enclosure contained the bison when Congress incorporated the monument into an expanded Grand Teton National Park in 1950. In 1963 biologists discovered brucellosis in the bison herd and killed all but nine vaccinated yearlings and calves, according to the 2007 Final Bison and Elk Management Plan environmental impact statement. Shortly after that, managers added another dozen brucellosis-free animals to the herd. Down to 11 animals in 1968, the herd escaped from the wildlife park and managers decided to let them be. 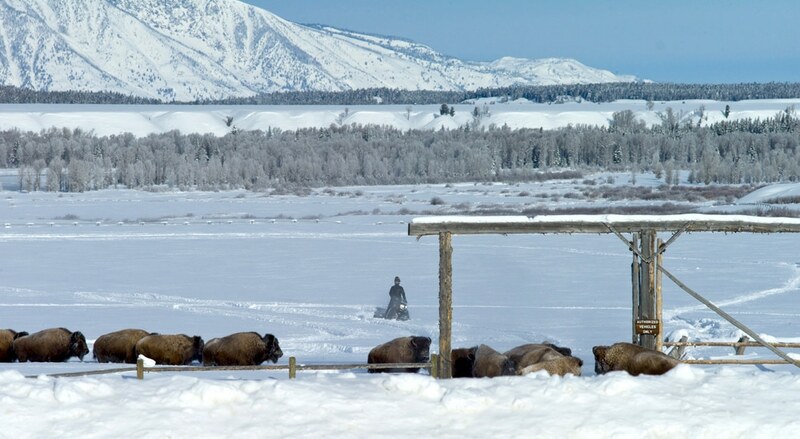 Bison had occupied Jackson Hole historically, so the decision seemed natural. In 1975, however, the 18-strong group found the National Elk Refuge. 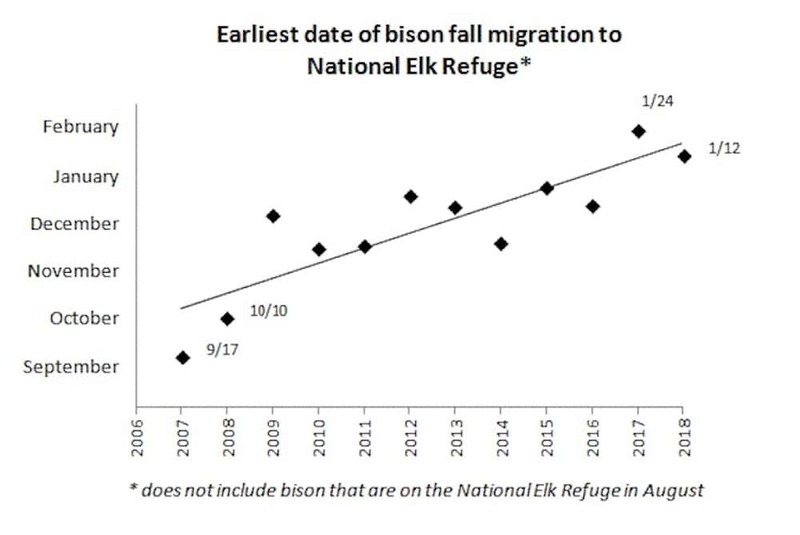 “The use of standing forage by bison on this winter range was viewed as natural behavior and was not discouraged by managers,” the EIS states. In 1980, however, the bison discovered the elk feed lines and their numbers began to grow dramatically. The expansion of Grand Teton National Park in 1950 allowed regulated elk hunting only and no shooting of bison. Keeping the herd near the population goal of 500 animals has been somewhat challenging for Game and Fish. Many of the cows keep to safe country in the national park, Gocke said. A few animals — mostly bulls — stray onto the nearby Bridger-Teton National Forest where they are fair game. Hunting also is allowed on the National Elk Refuge. The season this year ran from Aug. 15 through Jan. 31. Regulations anticipate that the hunt would end if Elk Refuge managers began distributing feed before Jan. 31. The caveat seeks to avoid baiting or shooting wildlife over feed. This season 122 licensed hunters killed 75 bull bison, according to the latest collection of information, Gocke said. Holders of 75 cow/calf licenses killed 16. This story was corrected on Feb. 12 to reflect that there were 122 licensed hunters that killed bulls, not 112. — Ed. From one old female to another …Good work, Sister. PS. Sometimes a smart old woman can lead her unruly herd to a better place…Maybe even the Congress. Not exactly sure of the geography here but good thing they didn’t head north into Montana, I think Montana fish and game usually shoot them if they wander into Montana . Thanks to folks who helped them move to safety. Fascinating and extremely well-written article. Kudos to the ranch owner, all the agencies involved, the general public and to the author for sharing this slice of Wyoming life with us.